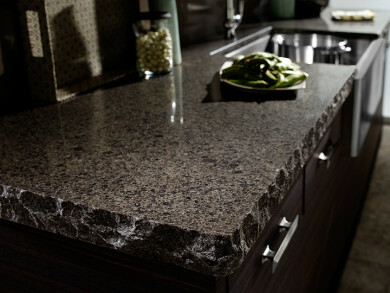 The edge profile is the perfect finishing touch for your Cambria countertop. It provides detail and depth to your design, and can make an incredible difference in the appearance of your kitchen. Cambria offers 19 edge profiles for you to choose from, but today we're going to focus on the 4 profiles which comprise the Architectural Edge Profile Collection. The Architectural Collection consists of 4 of the most dramatic edge profiles available, and each one makes a statement which will help your project truly shine. While the vast majority of Cambria's edge profiles are the same price by thickness, these four edges are priced separately by project. The Mitered edge is an edge assembled from two pieces, to give a countertop with less weight the appearance of a much heavier one. Rimrock is available in 2cm & 3cm thickness. This vanity shows the way that choosing a mitered edge can allow for the movement and pattern in your design to flow over the edge of your counters, to create the illusion of a solid piece of stone. For a natural, rustic appearance, choose this hand-finished profile. As this edge profile is truly chiseled stone, it has an authentic texture and adds incredible dimension to your project. Morraine edge is available in 2cm, 3cm, 4cm & 6cm thicknesses. A reversed and sharply slanted mitered edge gives this profile a dramatic appearance. It is available in 2cm & 3cm thicknesses. This edge seamlessly integrates flush with a cabinet door creating a modern, sleek look. Available in 2cm thickness. With fall in full swing, we've been seeing many gorgeous fall tablescapes floating around the web. With everything from full-blown jewel tones to simple monochromatic arrangements, we're rounding up our 5 favourite tablescapes to help inspire your home's fall decor. We love how this tablescape is simple and classic, while still embracing all the beautiful rich colours fall has to offer. The white tablecloth and plates take a backseat to the gorgeous natural pumpkins and leaves which are a simple and inexpensive way to add colour to your decor. At the other end of the spectrum, this tablescape is pared back and uses only white, blonde wood and wheat in it's colour palette. Playing up the warm neutral tones using gold cutlery is a gorgeous way to elevate this simple tablescape for a refined and luxurious look. If you're in the mood to be creative, we love this craft paper tablecloth! Paired with the simplest of all centerpieces, pillar candles & greenery, these place settings look welcoming and casual, while letting your guest know how very welcome they are at your table. Contrasted with the previous table's simplicity, this dark and moody table is absolutely over-the-top. We love the unconventional use of black for the tablecloth and plates, especially paired with richly hued flowers & foliage. Lastly, this simple and fun tablescape is both sweet and beautiful. There are so many ways you could play up this idea- we love how this one is a rainbow of apples, but we think it would look equally gorgeous with just one type of apple, or with both apples & pumpkins. One of the best things about Cambria is that it is low maintenance. Because it is completely non-porous, there is no need for harsh chemicals, abrasives or sealants to maintain the beauty and performance of the product. Today we're sharing our three favourite Cambria Approved cleaners for your countertops. The first gentle cleaner is simple household soap. Using a small amount of soap and warm water is enough to clean and sanitize the dirt of daily use. It is also the most gentle and chemical-free option for your home! For quick clean ups, we love to keep a container of Lysol wipes on hand. They are great for smaller messes and for peace of mind after preparing foods such as raw meats and cheeses. Simple Green is an excellent cleaner and has been rigorously tested by Cambria as one of the best ways to clean quartz. It is safe, effective and will not damage or alter the appearance of your Cambria Quartz. Always remember, never use harsh chemicals like bleach, acids, corrosives or alkaloids. There is no need and they can damage the finish of your beautiful countertop. Gentle cleaners are the safest and most effective choice for both your countertops and your family. For a complete list of all Cambria Approved cleaners, click here. 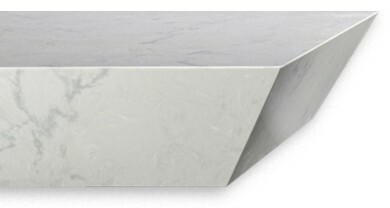 Waterfall countertop edges have become increasingly popular over the last few years. When initially introduced to the design world, they typically characterized only an ultra-modern aesthetic, due to their sleek lines and minimal look. However; as kitchen design moves towards a more eclectic and inclusive sensibility, we are seeing waterfall edges not only in modern kitchens but also as a surprising element of a traditional kitchen or even a bohemian inspired space. Waterfall countertop edges can be either a T-join, where the vertical piece fits in underneath a small overhang of the horizontal countertop, or installed with a mitered edge. Our company almost always installs our waterfall edges with a mitered seam (like above), because of the sleeker look and more invisible seam that a miter affords. Depending on the size of your countertop, a mitered edge can also offer a continuation of the veining on the horizontal aspect of the counter right down to the floor. Waterfall countertops both help to hide appliances and to protect wood cabinetry. A waterfall edge can also be used to create a completely built-in bar stool area, without requiring a raised bar top or separate piece of material. Another aspect of the waterfall countertop is that it allows you to enjoy the design of your countertop not only from a standing position in the kitchen, but also from across the room or while seated. It also looks incredible when paired with full height backsplash, as the two vertical planes emphasizes your design for maximum impact! Cambria has just released an even better way for you to envision your home with the breathtaking beauty of Cambria. Cambria Augmented Reality instantly shows you any Cambria design on your own countertops, islands and more! We are so excited that Cambria has offered this incredible technology to customers, as it will allow you to truly fall in love with the perfect design for your home. Seeing the movement and colour of any of the 140+ Cambria designs brought to life in your home is an amazing opportunity for each of you to experience before choosing your final design. The look of a frameless shower is incontrovertibly cleaner, more modern and easier to maintain than a traditional framed shower. The logical extension of this innovation in bathroom design is the to take the frameless shower and make it a no-threshold shower. A no-threshold shower features a flat surface running between the inside of a shower and the outside, which creates a beautifully clean design. We love the look of the no-threshold shower as it evokes feelings of luxurious hotels and indoor-outdoor shower spaces in tropcial locales. But it also means there are less crevices to clean, and for water to condense and cause problems over time. The only concern you need to have with a threshold free shower is to ensure that the water from your shower goes where you want it- and not all over the rest of your bathroom floor! There are two ways to accomplish this- the first being a traditional drain in your shower. The floor of your shower would be laid in a slightly downward elevation towards the drain in order to allow the water to be controlled by the natural forces of gravity. The second way is a trench-drain, in which a long drain is placed where your shower threshold would normally stand. This means you don't have to have a drain in the centre of your shower, yet you still get the polished look of a no-threshold shower. However; a trench drain is a less seamless look than having a traditional drain installed, as your floor tile will not carry on from the outside of the shower to the inside. It is up to you to decide which of these two options makes the most sense in your home! When it comes to countertops, there are a lot of options available to consumers. Not only are there a variety of materials to choose from, but each material has different manufacturers, benefits, and drawbacks. When we're seeking to educate our clients as to why we choose to exclusively offer Cambria Quartz, it really comes down to one thing: what did we want in our own homes? The answer is Cambria, and the reason is simple- we wanted the innovation, performance and beauty that only Cambria can offer. Innovation is the cornerstone of Cambria's business. The drive to innovate has pushed them to truly redefine and recreate both the look and performance of quartz countertops, while competitors simply fall behind. The durability and performance of Cambria means that for the consumer, they receive a surface that is 100% Food Safe - a claim which cannot be made by granite, marble, limestone or concrete. We simply believe that the surface you cook on for your family should be clean and safe. Cambria never needs to sealing, polishing or reconditioning. It cleans up with just soap and warm water, making it easy to care for and convenient for our busy lives. Cambria is also completely stain-resistant. No need to ever worry about red wine, chocolate or mustard staining your countertop. When you make such an investment in your home, we believe it should stand up to sticky fingers and cooking lessons. 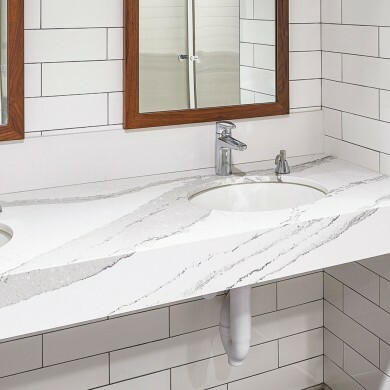 Because of the performance of this material, Cambria is confident in offering a Lifetime Limited Warranty; another way in which Cambria stands apart from its competitors. An excellent product and excellent service, that's what we believe our customers deserve. Lastly, we work with Cambria because of a core of shared values. Like Cambria, Quartz Craft is Family Owned. We share an entrepreneurial spirit and work ethic that means we're not satisfied until our customer is satisfied. If you'd like to learn more about Cambria, we'd love to share this short video that takes you on a journey to understand the technology, innovation and passion that fuels Cambria's designs. Undoubtedly one of this year's hottest trends, gold hardware is popping up all across trade shows, blog posts and design articles. Plenty of people are wondering if gold hardware is a flash in the pan trend, but we love a modern gold splash in a beautiful kitchen and think it is here to stay! One of the things to be mindful of when choosing your gold hardware is the tone of gold or brass you are using. 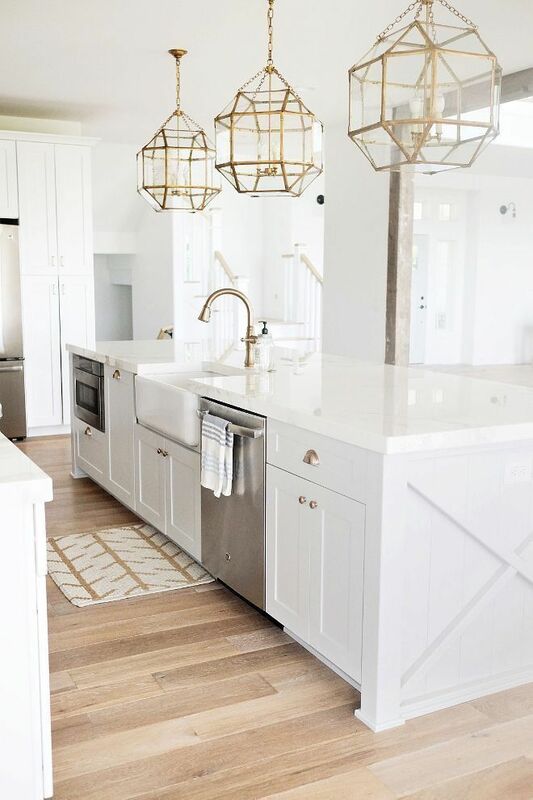 In the kitchen above, the creamy cabinets, countertops and warm neutral wood floors look fantastic with the buttery gold tone they used in the hardware. Using a soft gold in a bright space like this is a great way to make sure the space stays feeling delicate, sophisticated and classic. In the kitchen below, you can see that they have chosen a darker, antiqued brass for their hardware and lighting. This looks incredible in this space due to the deep hue of the cabinets. Because the dark cabinets add a dose of drama, the hardware can afford to look a tiny bit scuffed up, especially when paired with a vintage rug that adds incredible character to the space. This next kitchen uses large brass pendant lights to create a visual story connecting the kitchen hardware to other elements which can be seen from across the room. This is important to consider if you have an open concept living and dining area, since you will see your hardware from your living space. Using large brass pendants over the gold faucet will look cohesive from across the room - a clever way to solve this problem. 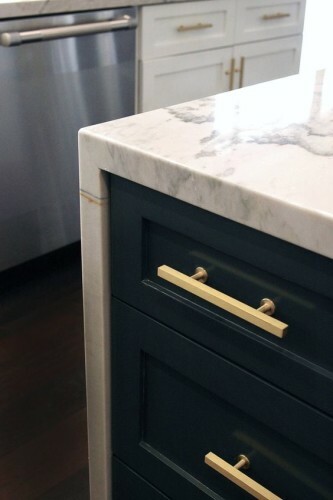 This kitchen uses a much brassier shade of gold in its hardware, which works with it's slightly nautical inspired look. Adding the brass rings to the backs of the bar stools is the type of attention to detail which takes a space to an entirely different level. Lastly, for those who are either truly committed to matching kitchen elements or for those who just can't get enough gold, this sink is absolutely to die for. We love the modern lines of the sink, faucet and soap dispenser juxtaposed with the classic feel that gold always brings to a room. Pairing this sink set with leather door pulls is a truly brave decision, but as you can see it looks absolutely beautiful in this setting. The Coastal Collection features some of the most breathtaking designs Cambria has to offer. Characterized by vast and expansive veins, swirling movement and glittering, seascape-inspired hues, the Coastal Collection offers drama, majesty and innovation all in one package. We love this collection for its unapologetic pursuit of natural and rugged beauty. We've picked our top 5 designs from this collection to share with you today. Since this collection was inspired by the rugged coast of Wales, these designs all feature a combination of sea, sand and rock textures and colours. "Warm and nurturing Earth tones of taupe, white, and robin’s egg blue-green blend organically in striking variation and glistening streams that prove not all masterpieces hang on the wall." We love Kelvingrove for its softness. Despite bold veining, the light and whimsical shades of robin's egg blue, blush sand and cream combine in a design that is versatile enough to be at home anywhere from a boardroom to a luxurious bathroom. "Like the fitful waters of a windy English bay, Seagrove recalls restless silver-capped waves roiling across a deep foamy sea with undercurrents of green lurking beneath the surface." Seagrove offers all the stunning drama you could want, with a neutral palette that fits into any design. Grey, charcoal, sand and faintest green are combined in rich and natural veins which create striking movement and beauty. "Calm and serene with dramatic accents, Summerhill is named for the Welsh coastal village where stately clouds drift gently out to sea across a silver-dappled sky." Summerhill is the perfect soft yet strong design. We love the steel grey, sandy beige and creamy swaths of colour that are emboldened just enough by a generous peppering of dramatic black. "Rich and opulent, Helmsley™ recalls the past glory of feasts and pageants held in the unyielding medieval castle firmly rooted in the market town of its name in North Yorkshire." Helmsley is the rich brown stone you've been looking for. With hues ranging from chestnut to praline, this design also incorporates the perfect amount of neutral grey to create a balanced palette. As a result, this design can work with a wide variety of cabinets and design features. "Sketching impressions of canals that connect three rivers with the sea, Ellesmere spins a tale of tall ships standing proud in a harbor off the moss-covered shores of a coastal town." Ellesmere is the perfect moody design to ground a dramatic and sophisticated kitchen or bathroom. A black background is broken up by generous veins of gorgeous white and gold pebbles, while richest rust and hints of tawny beige bring warmth and contrast to this incredible design. Although we must admit we are partial to full-height Cambria quartz backsplash, we also love the impact and texture tile backsplash can bring to a project. There are so many directions tile can take a design project, from understated to super bold. We're sharing 5 awesome tile backsplash ideas that we hope will inspire you in your own project! We love the bold, graphic & geometric design of this art-deco inspired backsplash. The patterned tiles can be arranged in different positions to create either a horizontal or vertical pattern, which allows for versatility in placement. We also love the way this backsplash is mirrored on the polished stone countertops for even more impact. These petite tiles have been arranged for maximum impact by the dual use of an interesting chevron pattern and a ceiling height install. The subdued colour palette and small scale allow this backsplash to add texture and interest without overwhelming the simple nature of this kitchen. These stunning patterned tiles evoke memories of days gone by in this modern classic kitchen. The black and white palette keeps these tiles within the tight colour scheme of this space. We love the traditional accent it adds, and since the cabinets and countertops are so simple these tiles bring a much appreciated dose of fun and heritage. These tiles are clearly the focal point of this small space. The metallic reflex of these tiles ranges in tone from gunmetal to copper and champagne. We love that they chose a high reflective tile in this space because it bounces the light around and makes it seem larger and more inviting. This last backsplash is for those colour lovers out there - a beautiful turquoise glass subway tile. In an otherwise neutral kitchen is the perfect pop to make this space feel young and fresh. Choosing a classic material such as subway tile is a great way to bring a touch of character to an otherwise modern very modern kitchen. We recently visited one of our wonderful client's kitchen design studio, and were struck with the beauty of one of their showroom countertops - beautiful Cambria Quartz's Harlech design. Seeing this beautiful design again reminded us of how much focus we tend to pay to cool toned countertops and kitchens, and we wanted to level the playing field a little by sharing our 5 favourite earth toned Cambria designs. Oakmoor is part of the Oceanic collection, and is characterized by bold cream and acorn veins which smoothly flow across its surface. Named for a small English village dating back to medieval times, Oakmoor aligns strands of caramel, tan, and cream to resemble the wood grain of stately oaks in the nearby countryside. Deep, moody and incredibly naturalistic, Langton combines deep brown, tan and charcoal grey for the perfect statement countertop. A masterful study of contrasts, Langdon is an intriguing design that calls to mind the ancient beige abbey stones standing steadfast against white-capped storm-gray waters off the coast of Kent. Helmsley is similar to Langdon in that it combines both grey and rich brown, but it is lighter and less moody. Rich and opulent, Helmsley™ recalls the past glory of feasts and pageants held in the unyielding medieval castle firmly rooted in the market town of its name in North Yorkshire. We love the deep brown veining throughout this stunning design. Combined with earthy caramel, wheat and black Harlech looks incredible with other earth tones, exposed brick, and cream cabinetry. The regal tones of this lavish design are inspired by Harlech Castle perched on high like an all-seeing sentinel keeping a watchful eye over the town of Snowdonia in North Wales. Galloway is the lightest design we'll discuss today. It is a neutral earth toned design, featuring a sand and wheat background with wide neutral bronze veins. Deep and mysterious like the waters off a rocky coast, Galloway lures furtive glances. It is a mix of sea, sand and time and shines like a luminescent pearl inside a rough and blackened oyster shell. With September already in full swing, we've definitely got warm autumn colours on the brain. This time of year is when its nice to cozy up your home, add some warmth and texture to make it the perfect cozy space for relaxing as the days get shorter and temperatures drop. The hue we're obsessing over this season is a beautiful sunny ochre - depth, warmth and vibrancy all in one. Ochre adds a classic, seventies-inspired warmth to any room, but the spaces we're sharing today make ochre feel perfectly modern. This deep, golden ochre couch is the star of this space. Brass accents, warm wood shelves and furniture amplify the effect of this stunning sofa, while grey walls and a blue-toned area rug keep this space balanced and understated. This space uses a tone-on-tone approach to play up the richness of this gorgeous colour. The sofa, floor, accessories and floor are all in shades of ochre, which creates flow throughout the space as your eye travels easily from one element to the next. Adding deep hits of black add drama and a grounding note to the room. This inspiration photo serves to show how far you can take a fabulous autumnal palette. Yellow, ochre, rust and chocolate all look incredible with a wooden stool and neutral grey backdrop. With a colour as strong as ochre, sometimes all it takes is a single pop of colour to make all the statement you need. This white room uses a single ochre pillow to pick up on the warm wood frames, floor and gold light fixture and create a cohesive feel. Similarly to the last photo, this room has only a single pop of rusty ochre in a space that is otherwise a haven of layered greys. Adding to the eye-catching properties of this gorgeous ochre chair is it's stunning fabric - a beautiful velvet. Using a textile with a texture which reflects light in unexpected ways is an excellent way to have many shades of an accent colour without using more than one piece. Matte finish countertops with the superior strength, durability and beauty of Cambria are now available in all 141 stunning Cambria designs! Silky smooth and as much a tactile experience as a visual one, these surfaces take kitchen design to a whole new level of understated elegance. Incredibly, these surfaces are still imbued with the durability, easy-care convenience and nonabsorbency of Cambria's high gloss surfaces. This gives you the same incredible everlasting surface with an entirely new sensory experience. Your style options are now expanded even more. There are so many beautiful designs available, and now with the versatility of a matte finish your design options are doubled without sacrificing performance. From the classic collection's solid base colours with the look of concrete, to the marble collection's honed stone effect, Cambria Matte finish looks incredible in every shade. Maybe it's due to this year's Pantone colour of the year (a vibrant green), or perhaps because pastels are having a moment, but we're seeing a new & unexpected colour combination rising in popularity recently: mint and black. There's definitely a retro feeling to this colour combination - it brings to mind minty bathroom tile from the 50's, but we've also seen it look perfectly fresh and modern. Today we're sharing three ways to incorporate this palette into your kitchen, if you're feeling bold, fresh and mint(y)! The first, and most permanent way we've seen minty green and black used in a kitchen is in the cabinets. This kitchen perfectly balances the softest shade of mint with sharp black cabinet frames. We love the ultra-modern shape of these cabinets with the unexpected pop of pastel colour. This kitchen incorporates our favourite pastel hue in a completely different way. Playing up the vintage vibe of this colour combination, these homeowners have chosen to accessorize their kitchen with pops of mint in their appliances and glassware. Black hood vents, cabinets and lighting make a sharp contrast against white subway tiles, while the whole space is warmed up with butcher block countertops. Lastly, the simplest, least expensive and least permanent way to incorporate mint and black into your kitchen is with paint. This classic black & white check flooring pops against soft mint walls. We love how easily painting this space can create an entirely new feel. Of course, we would be remiss if we didn't also include a little bit of mint inspiration for those who can't get enough of this shade. Cambria's Kelvingrove design has glistening streams of light robin's egg blue, and would look stunning paired with black accents. From breathtakingly natural designs to incredible durability, there's certainly a lot to love about Cambria. We spend our share of time admiring beautiful homes and kitchens which feature this beautiful product, and we think there are plenty of things to appreciate in each photo! One thing that doesn't come through in photographs is something we're touching on today - shimmer, glitter and reflective characteristics in Cambria quartz. Understanding the true nature of any shade is a task best done in person. Even Cambria designs without reflective elements, (such as super popular Britannica, Clare Anne and Swanbridge) are still so unique, nuanced and mercurial that we always recommend our customers make the time to at least view 12X12 samples, if not a whole slab before making their decision. This is especially true with the many Cambria designs with lively sparkle, as their incredible beauty is only fully appreciable in person! Many clients come to our showroom after viewing the designs online, only to find that in person they are completely charmed by a shade which they had previously discounted. We're sharing our top 5 Cambria designs which feature a little (or a lot!) of sparkle so you can have a few on your list to check out in person. Ellesmere is one of our favourite designs - period. It is dark, moody and mysterious, while containing so many beautiful neutral shades it is bound to complement nearly any kitchen design. Shades of wheat, amber, charcoal and white all flow together for a dramatic and bold look. But what doesn't come across in photos is the stunningly subtle golden shimmer which flows through this design. The tiny gold microcrystals glint and gleam to add a subtle glamour to this beautiful design. Annica is, in our opinion, such a unique design. From afar, it appears to be a classic marble design, but when you get closer you see it has a lot more going on! The marble veins are peppered with sophisticated gold and purple sparkle. We love that this design offers both the classic, refined appearance of a marble countertop, and the fun and excitement of a sparkly addition to any room. Berwyn is absolutely a dark horse in our offerings! Though it looks incredibly sedate in its product shot, in person Berwyn has so much life and vitality, it is breathtaking. Berwyn is completely neutral, with swirls of cream, taupe and tan, but it also boasts incredible sparkle under lights. It truly lights up a space with its elegant glimmer! Roxwell is an incredible design for so many reasons - we love the resolute bands of grey, cream and black. It creates incredible movement in any application, but also truly brings texture into a space through its subtle hints of glitter. Beaumont is a gorgeous creamy design with Ssimmering swirls of gold and crystal- white veining. It also boasts an exquisite and finely spun whorls of tiny golden glitter, to make this design truly glow. The all white kitchen has reigned supreme over the last decade in kitchen design. While we love light, white spaces and find their fresh & bright vibe inspiring, we're also big fans of kitchens that fly in the face of current convention. We're sharing 6 kitchens today that celebrate unique design; pairing dark cabinetry with beautiful Cambria Quartz. This kitchen is absolutely one-of-a-kind. Packed with unique details and tons of personality, this is one incredible space! The cabinetry in this space is a dark grey stained wood, which is boldly paired with walnut stained wood for the raised bar area. The choice of countertop design was therefore very important - it needs to pull the space together and keep it from feeling too heavy. This space is balanced perfectly by the use of Cambria's Brittanicca design, because it is bold enough to hold its own next to so many other design elements, yet ties the space together with its light and dark tones. While this kitchen features contrasting perimeter and island cabinet colours, both the smoky grey and deep blue island are dark tones with a lot of character. Because of the amazing giant windows in this space, the dark toned cabinetry appears crisp and inviting, not muddy. Bringing together the grey and blue shades of the cabinets is Cambria's Seagrove design. As part of the coastal collection, Seagrove is inspired by silvery waves of the sea, and it has undertones which look incredible paired with this space's colour palette. This kitchen has a completely different vibe to the last. It is modern, fresh and simple. The mitered edges of the countertop and no-profile cabinet doors look incredible together. Warm dark wood was the choice for these cabinets, and paired with Cambria's Montgomery design creates a refined space for a modern family. While similar to the last kitchen in general principal, we love how by simply changing the type of wood for the cabinets you can create a completely different feeling in a space. This kitchen features a wood with a much more prominent graining effect, which immediately makes a space feel more casual and laid back. To contrast with the wood cabinets and add a touch of prestige, these homeowners selected Galloway for their countertops. Lastly, we wanted to include one example of a kitchen with a dark-on-dark colour scheme. Most homeowners look to add contrast to their design by picking a countertop which pops against their cabinets; but that doesn't have to be your only option. This kitchen features inky cabinets paired with Cambria's Sharpham design. Featuring icy white veining on a black & dark grey background, Sharpham always brings drama to any room. Paired with dark cabinets, the look is over-the-top luxurious and incredibly cool. Art Deco design is synonymous with the ultra glamorous time period of the 1920's. We've all seen the beautiful buildings, fashion and art that came out of this period, and marveled at their lasting appeal and relevance. Art Deco interiors were characterized by the use of bold geometric shapes, sharp contrast of dark and light, extensive inclusion of mirrors, and a generous helping of gold, brass, steel, copper and iron for a medley of metallic hues which quite literally made these spaces glitter. The Art Deco style is still one which many homeowners find attractive, and often elements of this classic period are thoughtfully included in the modern home as an homage to modernity, function and glamour. Today we're sharing 3 bathrooms and 3 kitchens which implement characteristics of the Art Deco period. We hope you find them as inspiring as we do! This bathroom nails so many of the characteristics we spoke of above, as well as one we didn't. A clear and sincere preference for symmetry is one of the hallmarks of the Art Deco period. This bathroom pays close attention to balance and symmetry, which makes an immediate impact on the viewer and creates an impression of precision and intention in the room. This bathroom's mirrored cabinets are adorned with stunning period mullions. Intricate mullions such as these were very common during the period of the 1920s, as a way to reinforce the design and add impact through repetition. These mirrors are found throughout this bathroom, from the sides of the bathtub to the walls, and are an incredible testament to the use of geometric patterns as a design feature. This modern bathroom is clearly inspired by many elements of the Art Deco Period. Gold accents and high contrast black and white accesssories are paired with geometric sconces, lacquered sink and toiletry stand and a marbled stone bathtub, emphasizing the sumptuousness of the materials. This kitchen incorporates many of our favourite elements of Art Deco design - the quirky lighting, mullioned glass cabinets and playful contrast of dark and light are all immediate standouts. We also love the use of a tin ceiling to adorn even the ceiling in this space. Intricately carved cabinets paired with ultra-modern barstools prove these homeowners aren't afraid to be bold in their design! This beautiful kitchen is a modern interpretation of classic Art Deco style. Boldly black, white and metallic, this kitchen scores high points for uncompromisingly beautiful decor. The black and gold hood range is accented by the contrasting white borders on the cabinet panels, while the bar stool chairs are also bordered. This attention to detail helps to tie together disparate elements and make a space feel cohesive. Attention to symmetry in the lighting, shelving and layout are also essential parts of what make this kitchen so impressive. Lastly, this kitchen is an ultra-modern omage to Art Deco styling. The tight colour palette, paired with vintage inspired chairs and clean, geometric countertops all speak to an inspiration rooted in the 1920s. Gold veining in the countertops as well as brass fixtures and faucet are the delicate touches which help give this room that extra glamour to take it from beautiful to spectacular. This kitchen embodies so much about Art Deco design - elegant details, expensive materials, symmetry and geometric designs, while interpreting it in a wholly modern way. One of the best things about Cambria Quartz is the huge variety of design options they offer. We love being able to supply our customers with a perfect Cambria design to make their kitchen and bathroom dreams come true. Truthfully, there are way too many absolutely stunning options for us to pick just one of our favourites, but today we're going to share our top 5 picks from the super chic Desert Collection - our Desert (Island) picks, if you will. The Desert Collection is described as "Calm and sophisticated designs offer understated elegance and a foundation for unlimited decorating versatility. ", and we couldn't agree more with this characterization. Each of these colours are endlessly stylish, and add polish to any space. Inspired by soft early morning fog, Dunmore is a breathtaking shade which creates a refined atmopshere in any room. Neutral in tone and subtle in finish, Dunmore is available in both Cambria High Gloss and Matte finishes, for even more design versitility. Devon is the perfect deep grey - smoky and elegant. Inspired by the rocky shoreline of Devonshire, this desert colour would be right at home in either a coastal getaway or a modern high-rise. Canongate is a deep grey-green with subtle variations and plenty of mystery. This shade is another take on a neutral countertop, as it is firmly planted in the grey tones, but with a twist of olive undercurrents which make it an unexpected and refreshingly unique design. Navy is truly the ultimate choice for crisp and classic designs. Hadley is inspired by the deep blue of the sky at twilight, and is the perfect complement to any bold kitchen. Whitehall is simple, elegant and timeless. A pure white field is flecked with tiny light grey shards, giving the impression of light filtering through glass. Whitehall is a design which will never disappoint, as it is the ultimate in chic sophistication and versatility. Industrial-inspired spaces are incredibly popular right now. Combining modern innovation with vintage charm, industrial design is a perfect way to create a warm, inviting and balanced space. 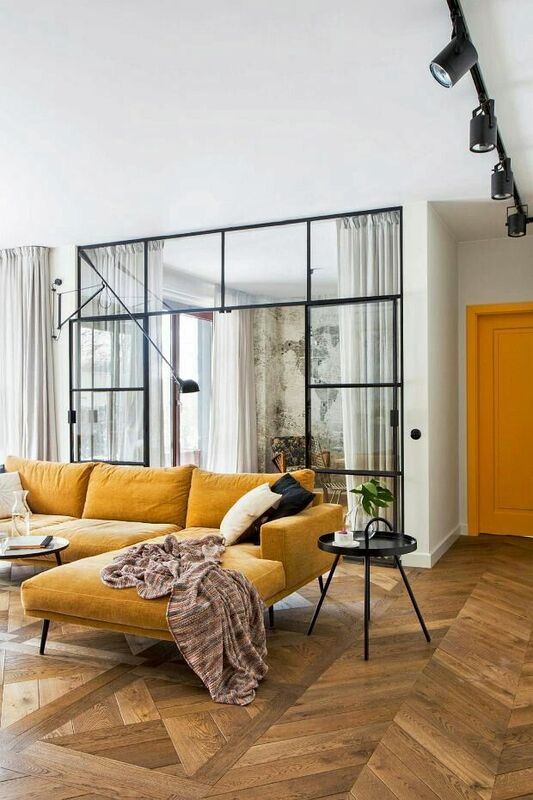 Industrial decor and home design is based on the principals of juxtaposition- industrial elements like glass, sleek chrome and blackened iron are softened by combining them with warm elements like brick, wood and leather. Cambria quartz is the perfect choice for use in any industrial inspired space, due to its incredible versatility and striking beauty. Cambria comes in over 140 designs, and now 16 of our most popular designs are also offered in a new matte finish. Both high gloss and matte finishes have value in industrial inspired designs. A high gloss finish creates incredible shine, and looks incredible paired with rustic wood elements, while Cambria Matte's finish mimics the effect of industrial elements like concrete and honed stone. If you're looking to create character in your space, consider using reclaimed materials like wood, brick and glass. Combining truly aged materials with modern appliances, countertops and accessories will help add texture and depth while reducing the carbon footprint of your project. If available, features such as exposed ceilings, interior brick walls and original flooring are excellent components of this design style. When choosing Cambria quartz for an industrial-inspired space, consider using elements such as waterfall gables and mitered edge countertops. The strong & modern rectilinear elements of these features look amazing combined with character features such as crown moulding, reclaimed floors and exposed brick. The key to success in creating a modern industrial inspired space is to ensure you select materials which create dynamism and contrast, while complementing their opposite counterparts. Balanced design feels welcoming, comfortable and approachable, so keep this in mind when selecting your materials!